The Trump administration warned of “serious consequences” after Venezuela’s government froze the bank accounts of Interim President Juan Guaido, 35, on Jan. 29. State-run oil company PDVSA is trying to find a way around sanctions, imposed by the United States on Jan. 28 to curb crude exports and drive incumbent Venezuelan President Nicolas Maduro, 56, from power. The sanctions have caused global oil prices to soar, angering China and Russia. The measures are also the strongest yet against Maduro, the former union leader who is blamed for the country’s economic collapse and an exodus of millions of Venezuelans in recent years. 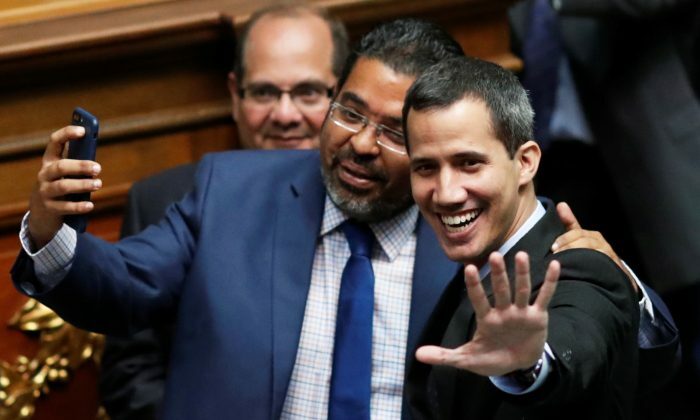 Guaido challenged Maduro’s claim on the presidency one week earlier. Venezuelan Attorney General Tarek Saab confirmed he has asked the Supreme Court to open a preliminary investigation into Guaido, accusing him of helping foreign countries interfere in internal matters. He also asked the court to impose a travel ban on Guaido and freeze his bank accounts. The United States and a number of other countries have recognized Guaido as Venezuela’s legitimate head of state and denounced Maduro as a usurper. Maduro, sworn in on January 10 for a second term after disputed elections in 2018, accuses Guaido of staging a United States-directed coup against him. Maduro is backed by a number of countries, including Russia. Maduro’s inauguration led to mass protests throughout Venezuela. U.N. human rights spokesman Rupert Colville said more than 40 people are believed to be dead after political violence a week earlier, including 26 shot by pro-government forces, five killed in house raids, and 11 during looting. Colville said more than 850 people were detained between January 21 and 26, including 77 children, some as young as 12. Guaido does not underestimate the threat of imprisonment and does not think it is “anything new.” Many opposition leaders have previously been imprisoned in Venezuela. “We are here. We will keep acting and working to confront the humanitarian crisis,” Guaido said at a press conference. Many experts believe sanctions and other measures against Maduro will only encourage him to step down, especially if he loses the support of the powerful military, which until now has been mostly loyal to the leftist ruling party founded by late President Hugo Chavez. Maduro appeared on a television broadcast from a military base, praising the soldiers’ loyalty. The U.S. State Department has certified Guaido’s authority to control certain assets held by the Federal Reserve Bank of New York or other U.S.-insured banks, including government and central bank accounts. PDVSA has responded to sanctions by ordering customers with tankers waiting to load crude oil destined for the United States to prepay, according to sources. There are concerns such prepayment could violate sanctions, setting the stage for a standoff at ports. The company is also asking major buyers, including U.S. refiners, to renegotiate contracts, according to sources. The Moscow Kremlin condemned the sanctions as “illegal interference,” while China warned this would only create suffering that Washington will be responsible for. Both countries have lent billions of dollars to Venezuela and are concerned about the new stress on debt payments. International Brent crude oil futures rose over 2 percent on January 29. Venezuela is among the world’s largest heavy crude oil producers. Russian Deputy Finance Minister Sergei Storchak said the sanctions could create difficulties for Venezuela in servicing its sovereign debt to Russia, which stands at $3.15 billion. In Geneva, senior United States and Venezuelan diplomats traded barbed words at a disarmament conference. Venezuela Ambassador Jorge Valero said the Trump administration is already preparing a “military invasion” and questioned whether Washington had the right to “impose a diktat” on Caracas. Venezuela has sunken into economic and political turmoil under the socialist government, with inflation soaring to 10 million percent in the past year. Loss of revenue from the United States, a top buyer of Venezuelan crude, is sure to further hamper the socialist government’s ability to import basic goods like food and medicine, exacerbating a humanitarian crisis that prompted more than 3 million people to leave the country in recent years.